Tech Week is Ireland’s nationwide festival of technology aimed at students, parents and the public and providing hands-on opportunities to learn about how computing and related technology are shaping every area of life from education to health, environment, social interaction, leisure and citizenship. Organised by the Irish Computer Society, Tech Week was supported by the SFI Discover programme and tech industry sponsors including Salesforce, Google, Lero and Púca. “It’s a fun festival of technology with a serious ambition. Ireland needs over 45,000 skilled new ICT professionals by 2018 to fuel the continuing growth of our economy. Achieving this goal will be very challenging, given the 27% drop out rate among first year computing students. Also of concern is the fact that less than 20% of computing students are female,” said Jim Friars, CEO of the Irish Computer Society. Púca designed the Tech Week event app to encourage interaction and educate students about Computer Science in the lead-up to and at the event. 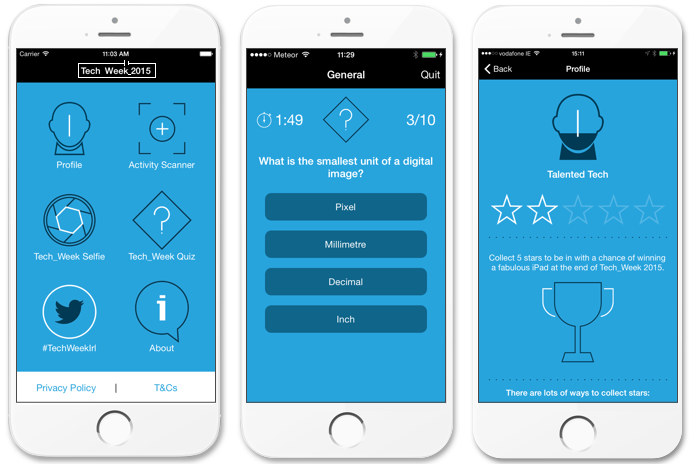 The activities in the app included multiple choice quizzes to test your computer science knowledge, a “Tech Week Selfie” feature, and a live Twitter feed which kept users up to date throughout the event. A built-in activity scanner allowed users to scan QR codes both in the activity packs sent to schools and at the event to activate augmented reality displays and additional quizzes. App users were rewarded with stars for completing the in-app activities, and encouraged to share their activities across social media channels. With an audience of over 100,000 pupils nationwide at Tech Week and a high level of engagement with the app, the Irish Computer Society were delighted with the feedback. The Tech Week event app has proven to be a really useful tool in helping inspire students while simultaneously educating them about computer science. Check out the Tech Week mobile event app video case study on YouTube.